The Cadillac will be sold at H&H Classics Chateau Impney sale on July 10th in the Midlands for an estimated £35,000 to £45,000. The car was owned by the Archbishop of Boston, Richard J. Cushing (1895-1970), a close friend of the Kennedys (who were Catholics). He officiated at the marriage of John F. Kennedy and Jacqueline Bouvier in 1953 and he baptised many of the Kennedy children and gave the prayer invocation at JFK's presidential inauguration in 1961. Cushing also led the religious ceremony at President John F. Kennedy’s funeral in 1963. Research indicates that this car would have carried the Cardinal to all these happy and sad Kennedy events. 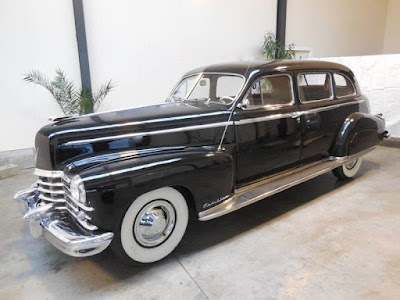 The 1949 Cadillac 75 Fleetwood 5-passenger Sedan has a 160 hp 5.4 litre V8 engine. Only 220 cars of this type were made and this is number 103. It is finished in black with a beige/brown cloth interior with wooden trim, and whitewall tyres and has a 4-speed Hydra-Matic (automatic) gearbox. The car is fitted with electric windows and it still has the original radio. It was one of the last Cadillacs with 'Turret-Top' styling. The car is well restored, is in excellent condition and will turn heads at shows or on the road because of its fascinating history and massive size - 5,7 meter (226 inches) length, 1,83 meter (68,5 inches) height and 2 meter (82 5/16 inches) width. There is a copy of a letter from the Cardinal in the car's files, dated 1968, to Mrs Jeanne Klonel, stating: 'I pray that you may enjoy this possession for many more years and that it will carry you safely wherever you go'. He also apologised that it was just a brief letter, because he was still mourning the death of Robert F. Kennedy who had been buried only a few days earlier. The car comes with a large file of its history including all the work relating to its restoration.